As recently reported on Indygamer, there's a fun new game out called Rose and Camellia. 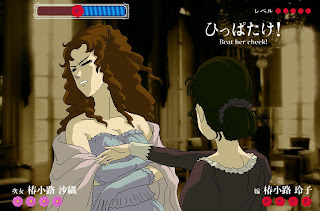 Playable in your browser, this entertaining and fairly unique concept allows you to slap around some unruly ladies, Victorian style. Unfortunately the story behind any of it eludes me on account of the language barrier, but that shouldn't deter you from wasting your precious time with this little gem. Update: Rose and Camellia has now been updated with a complete English translation. Wow, it all makes sense now! Ah the struggle of the "lowborn" woman among the aristocrats. "This is the elegant art of feminine conflict."